Musing on a day off…because I have a day off. 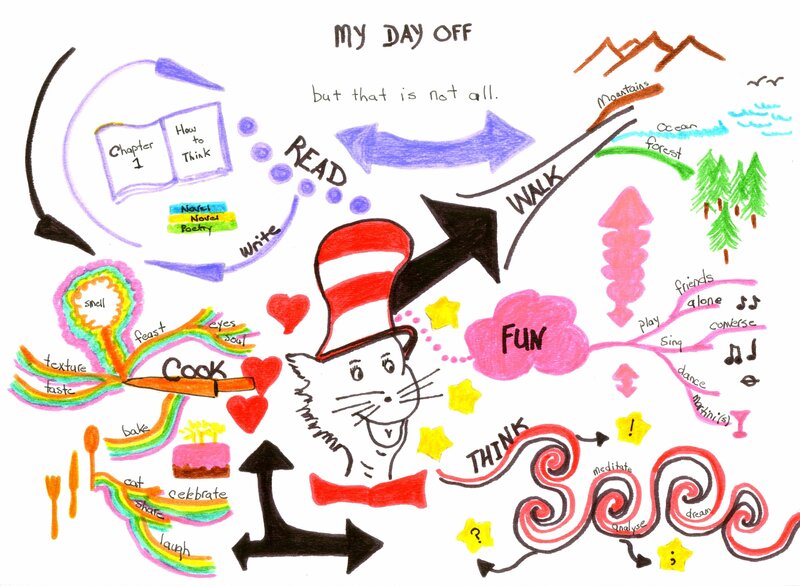 The exploration of the idea of ‘my day off’ in a mind map was initially thought of as a way to capture the abstract idea of ‘fun’ – what makes a day off different than a day at work, for example? The choice of the Cat in the Hat as a central image was immediate; this is for me an evocation of childhood, and the sense of freedom and spontaneity that childhood play evokes. It can be difficult to maintain that sense as an adult; of course responsibilities get in the way but other inhibitions intrude also. Work is very much play for me, never the less, a strict schedule is defined by a bell, and the sense of ‘flow’ – of losing track of time in an intensely pleasurable pursuit – is always interrupted. But the division of work and play is not a strictly defined boundary in my life. That was the most interesting part of the exercise – the recognition that the “basic ordering ideas” of the mind map – ‘think’, ‘fun’, ‘walk’, ‘read’, ‘cook’ – are the ingredients of everyday, not just days off (Buzan, T. & Buzan, B., 1993). This is where the balance of work/life exists – a day that contains these essential elements is both a pleasurable and a productive day, whether at work or play.